Caspar David Friedrich (1774–1840), Moonrise over the Sea (c 1821), oil on canvas, 135 x 170 cm, Hermitage Museum Государственный Эрмитаж, Saint Petersburg, Russia. Wikimedia Commons. Painting is about looking, and what you can see, so it might appear paradoxical to paint motifs which deliberately constrain their content. But the artist can use those constraints to concentrate the viewer’s attention on certain features or passages in the painting – one of the purposes of chiaroscuro techniques more generally. Nocturnes, paintings showing their motifs at night, have a very long history. Humans may lack the night vision of nocturnal hunters such a the cat family, but once our vision is dark-adapted, the light of a full moon can appear dazzlingly bright. 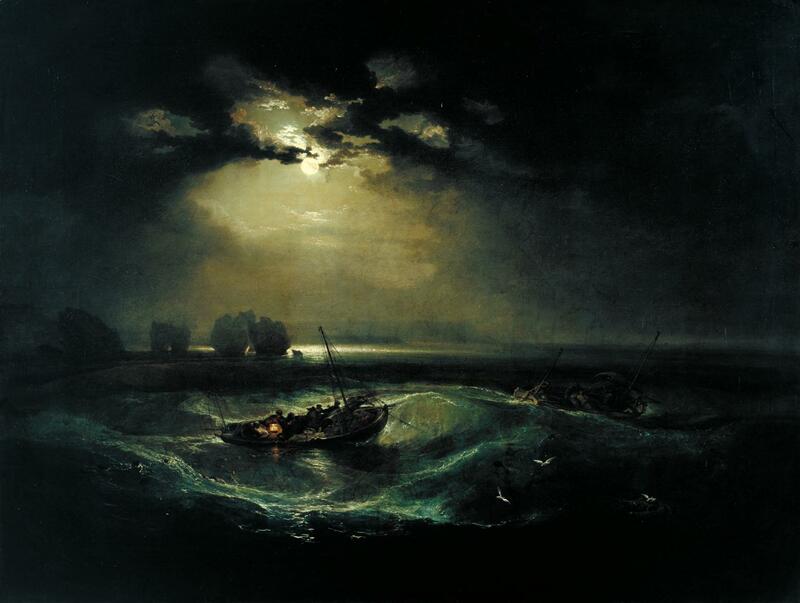 Many landscape artists have painted the occasional nocturne, and some have specialised in moonlit scenes, building successful careers on the demand for paintings which are that bit different. The coast has been a popular theme among those who paint nocturnes. In addition to the coincidence of land, sea, and sky, it offers excellent prospects for special effects such as the moon’s reflection on water; when painted well, this has widespread aesthetic appeal, and can readily dominate the bright tones of the painting. Painters can also exploit our emotional associations with the dark: storms, imminent danger of shipwreck or catastrophe, profound calm, solitude, and isolation are all themes which are readily evoked in coastal nocturnes. Here are some examples. 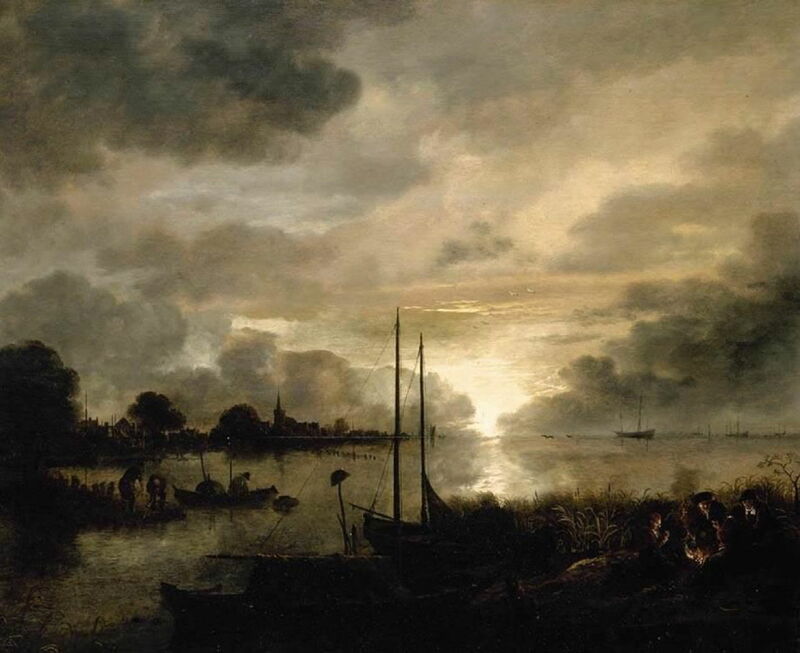 Aert van der Neer (1604–1677), Estuary Landscape by Moonlight (date not known), oil on panel, 63 x 76 cm, Private collection. Wikimedia Commons. In the middle of the seventeenth century, during the Dutch Golden Age, Aert van der Neer came to specialise in nocturnes lit only by the moon and fire. Among these is his undated Estuary Landscape by Moonlight, which uses light from both to great effect. Landscape details are shown largely in silhouette, and lack internal detail, except in the group gathered around the fire in the foreground. 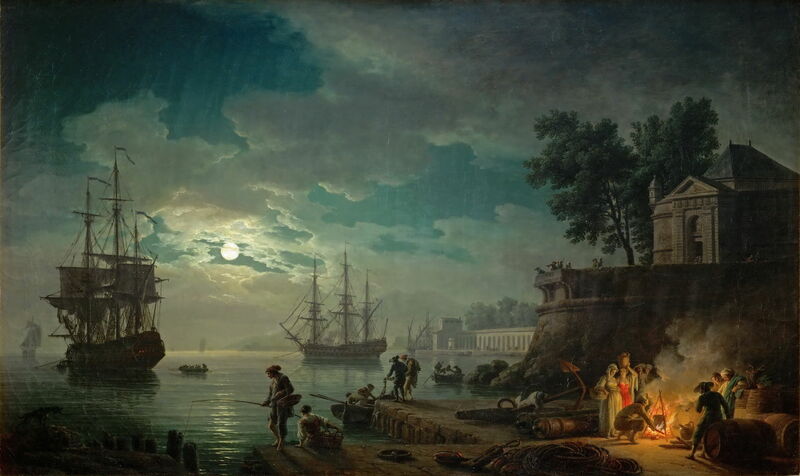 Claude-Joseph Vernet (1714–1789), Seaport by Moonlight (c 1771), oil on canvas, 98 x 164 cm, Musée du Louvre, Paris. Wikimedia Commons. I have shown other paintings in Claude-Joseph Vernet’s series of coastal scenes from the Mediterranean, showing a storm, and calm weather. He also painted this nocturne of Seaport by Moonlight in about 1771. Shown in the Paris Salon of 1773, it too derives light from the moon and an open fire, whose colours contrast very effectively. Its location will have been idealised, but with a full moon rising above the horizon, it shows the early evening in winter, looking east. Probably the most famous and successful coastal nocturne of all time is JMW Turner’s Fishermen at Sea (1796), showing small fishing boats working in heavy swell off The Needles, on the Isle of Wight. Remarkably this was his first oil painting to be exhibited at the Royal Academy. Turner was following a vogue for nocturnes which had been established by British painters in the late eighteenth century, and like Vernet used the colour contrast between the moon and the relatively feeble lantern in the boat shown in the centre foreground. Close examination of the painting reveals that, even at this early stage in his career, Turner was not painting motifs as they were in nature: from the position of The Needles, this view would look to the south-west from Totland Bay. Yet he shows the distant promontories of the south-west coast of the Island, as if the view was made round the other side of The Needles in Freshwater Bay looking south-east instead. Another group of chalk sea-stacks was located there, with some common appearances to those at The Needles, and it is probable that Turner merged them and added the background from the south-west coast. As Turner rose to fame, coastal nocturnes became a feature of the work of another great Romantic landscape artist, Caspar David Friedrich. Caspar David Friedrich (1774–1840), Greifswald in Moonlight (1817), oil on canvas, 22.5 × 30.5 cm, Nasjonalgalleriet, Oslo, Norway. Wikimedia Commons. Friedrich’s earlier coastal nocturnes include meticulously detailed views such as this of Greifswald in Moonlight (1817). Greifswald was the city of his birth, and is in north-east Germany, on the Baltic coast. At the time, this was part of Swedish Pomerania, a former Swedish dominion, which was ceded to Denmark in 1814, then to Prussia in 1815, just a couple of years before Friedrich painted this view. 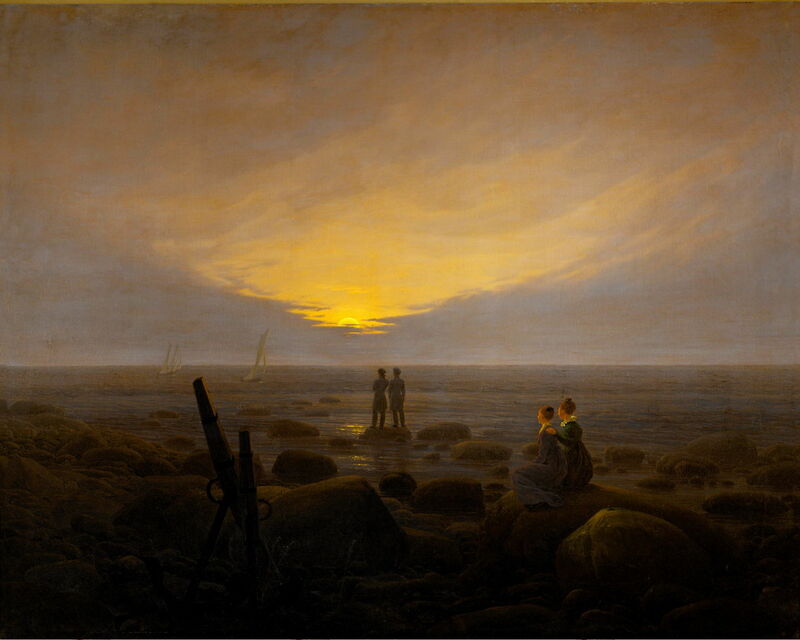 During the 1820s, Friedrich added enigmatic figures to these coastal nocturnes, as seen in his Moonrise over the Sea from about 1821. Caspar David Friedrich (1774–1840), Moonrise by the Sea (1822), oil on canvas, 55 × 71 cm, Alte Nationalgalerie, Berlin. Wikimedia Commons. Another variation is shown in his Moonrise by the Sea (1822), showing the view from a boulder-strewn beach, looking out to sea as the moon rises from behind a bank of cloud. The sea is calm, and glistens in the moonlight. Two fully-rigged sailing ships head straight towards the beach, the nearer furling its sails so as to lose way, the further still under full sail. On the top of the largest boulder, in the middle of the painting, are three people: two women sit close together, a man slightly to their right, all three gazing intently at the ships. 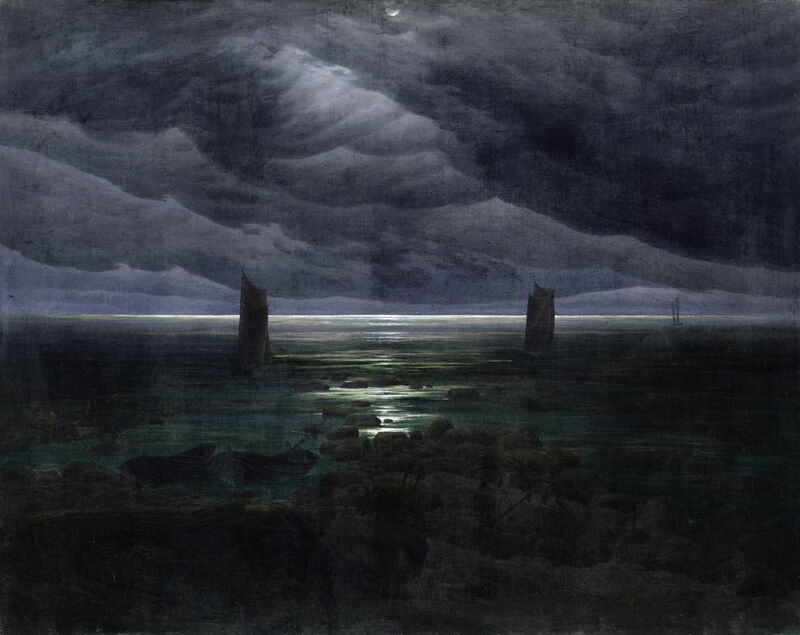 Caspar David Friedrich (1774–1840), The North Sea in Moonlight (1823-24), oil on canvas, 22 x 30.5 cm, Národní galerie v Praze, Prague, The Czech Republic. Wikimedia Commons. Other views, such as The North Sea in Moonlight from 1823-24, appear more conventional landscape compositions. These culminated in his most famous and enigmatic painting, The Stages of Life, in 1835, which is set at dusk rather than in moonlight. Caspar David Friedrich (1774–1840), Seashore by Moonlight (1835–36), oil on canvas, 134 × 169.2 cm, Kunsthalle, Hamburg. Wikimedia Commons. 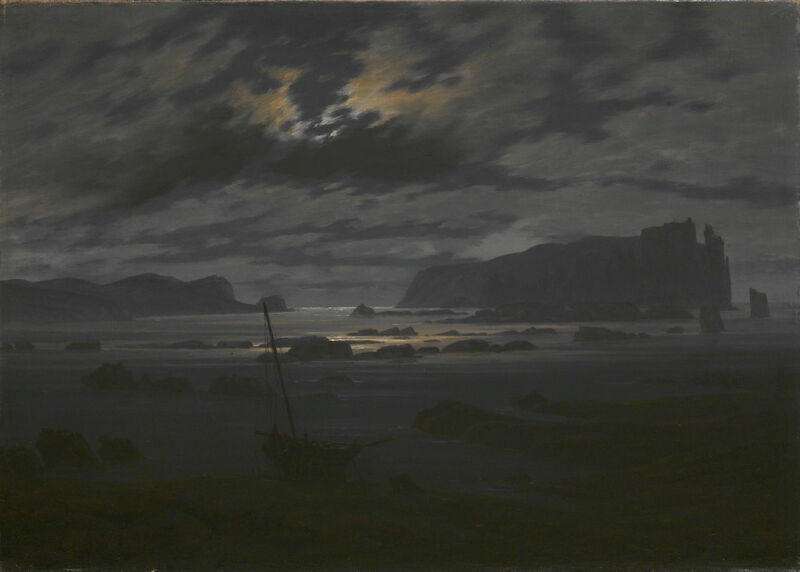 Slightly later, Seashore by Moonlight (1835–6), one of his last oil paintings, is much darker and full of foreboding, perhaps of his own death. Three small fishing boats are shown at different distances from a rocky shore. Two small rowing boats are just visible in the gloom of the foreground, and there are black shadows of fishing gear. The horizon is lined by the bright reflection of the moon, the brightest tone in the whole painting, and moonlight glints on the central area of sea. The clouds are deep indigo, in smooth folds and curves threatening rain. 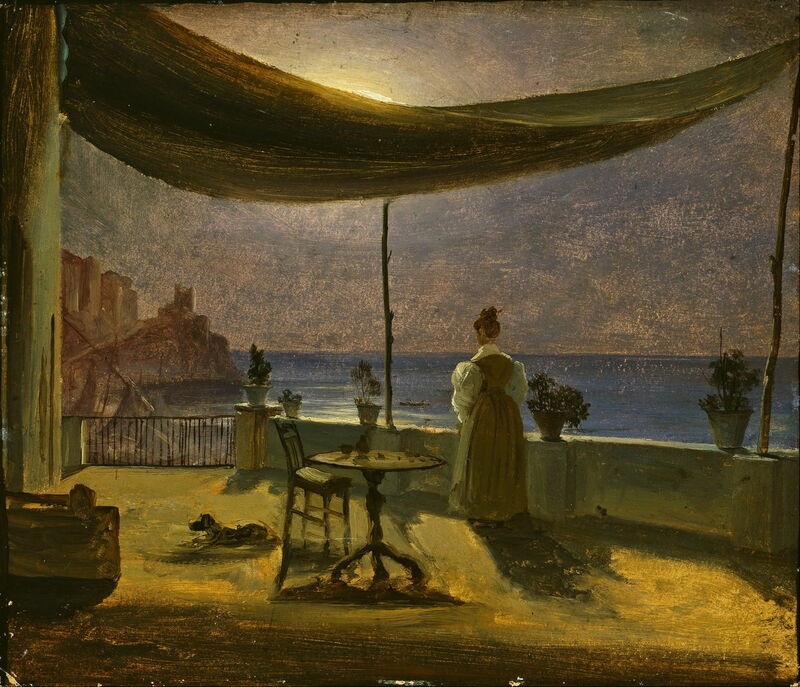 Thomas Fearnley (1802–1842), A Terrace in Amalfi in Moonlight (1834), oil on paper on cardboard, 26 x 30 cm, Nasjonalgalleriet, Oslo, Norway. Wikimedia Commons. The Norwegian landscape specialist Thomas Fearnley painted A Terrace in Amalfi in Moonlight in 1834, as an occasional and thoroughly atmospheric nocturne. Amalfi is a town on the south-west coast of Italy, set amid a famously scenic coastline. Fearnley uses the cunning device of the awning to hide the direct light of the moon, in what must have been a plein air sketch, executed at some speed. Fearnley had been a student of the founder of the Golden Age of Norwegian painting, Johan Christian Dahl. 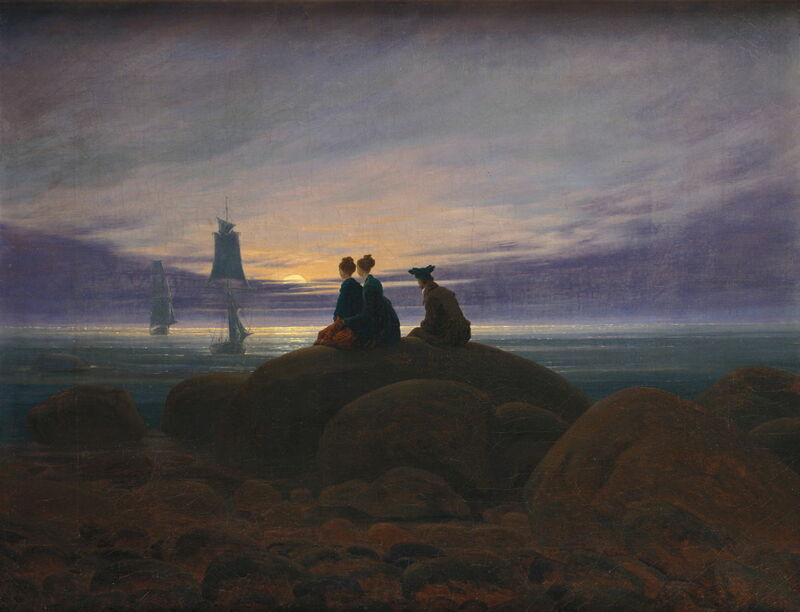 Dahl had already painted a number of coastal nocturnes in the Mediterranean when he moved in with Caspar David Friedrich in 1823, and both Dahl and Friedrich were made honorary professors of the Dresden Academy the following year. 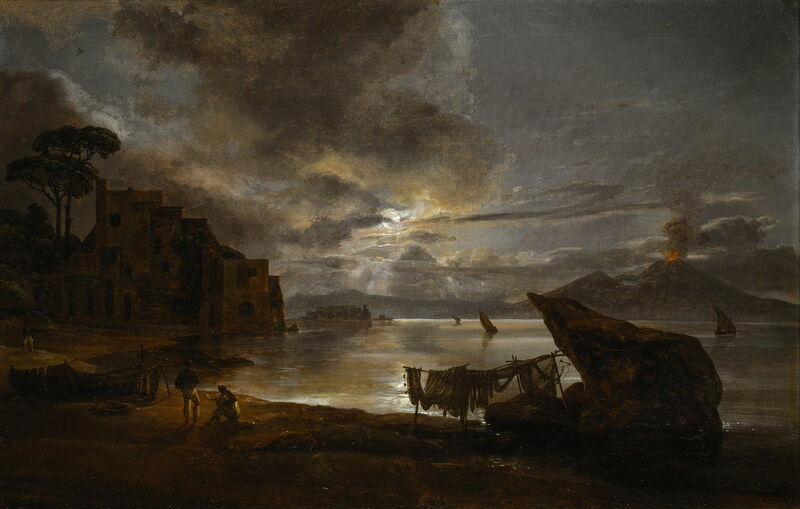 JC Dahl had been invited to join Prince Christian Frederik near Naples in 1820, and the following year painted The Bay of Naples by Moonlight (1821), one of his finest works. As with Vernet and Turner before him, he used the warm red light from Vesuvius to provide colour contrast, and like Friedrich he put fine detail of fishing nets in the foreground. 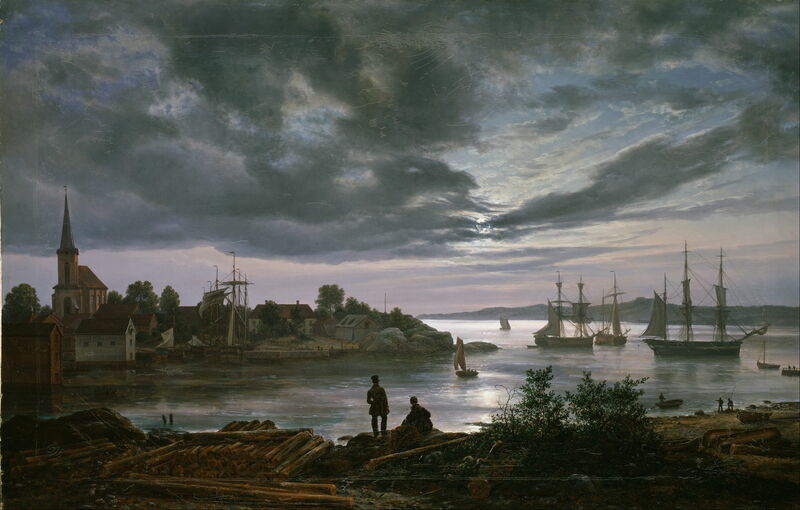 Johan Christian Dahl (1788–1857), Larvik by Moonlight (1839), oil on canvas, 99 × 156 cm, Nasjonalgalleriet, Oslo, Norway. Wikimedia Commons. 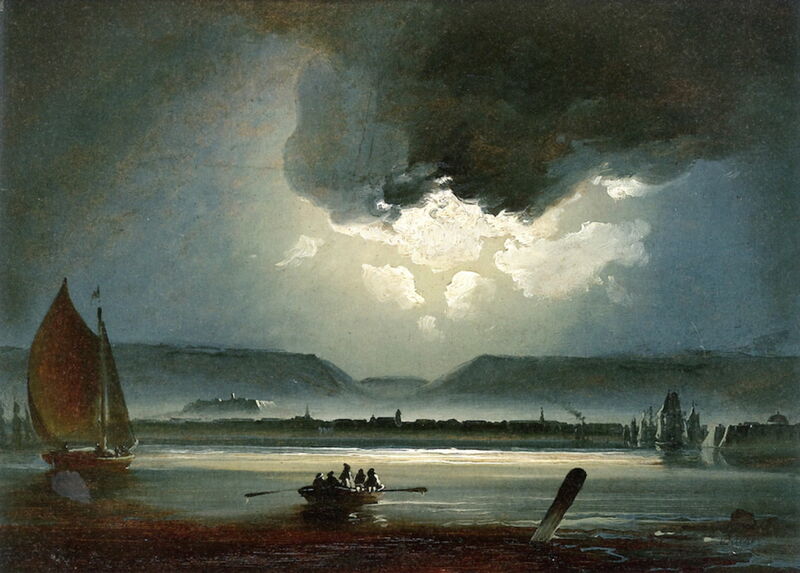 Dahl also started a fashion for painting Scandinavian ports at night: this is his Larvik by Moonlight (1839), which has fuller detail in the landscape. 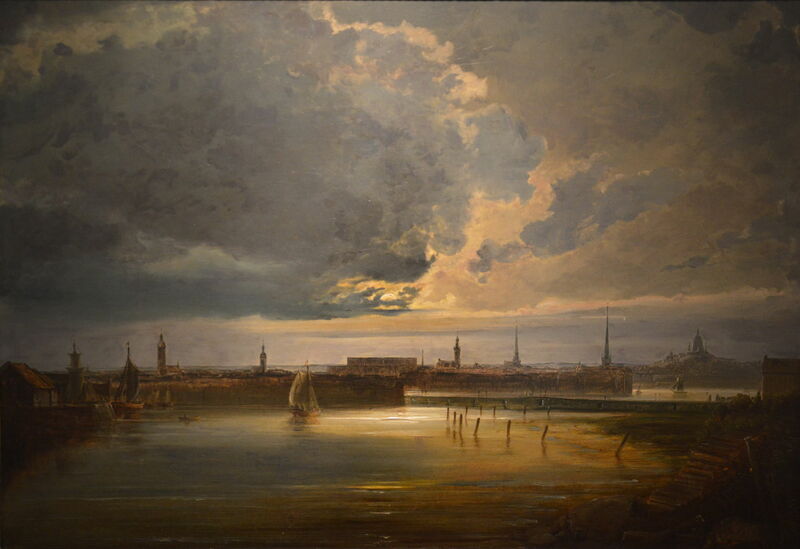 Johan Christian Dahl (1788–1857), Copenhagen Harbour by Moonlight (1846), oil on canvas, 96 × 154 cm, Metropolitan Museum of Art, New York, NY. Wikimedia Commons. 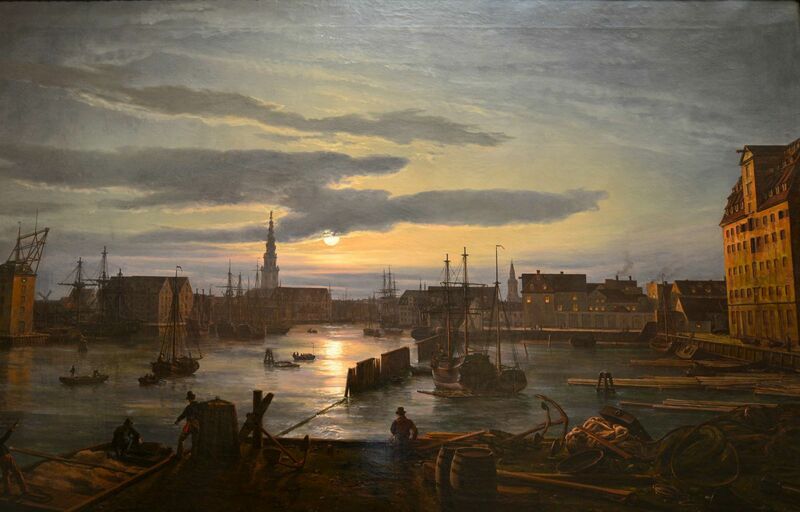 In Dahl’s Copenhagen Harbour by Moonlight (1846), warmth is added in the reflected light from the red-brown facade at the right, and lights in many of the windows elsewhere. 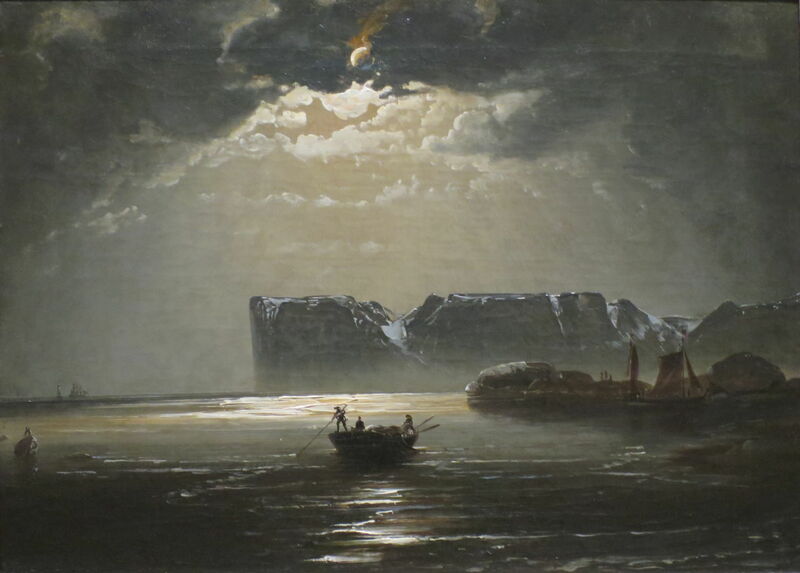 Another student of Dahl who became familiar with Friedrich’s coastal nocturnes was the Norwegian Peder Balke, who went on to become something of a specialist himself. 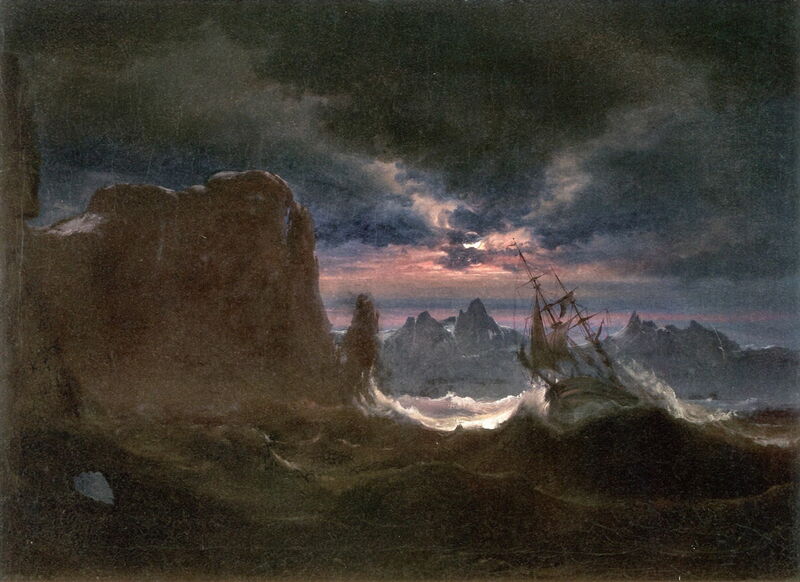 Balke’s dramatic Ship in Breaking Waves (c 1840-49) takes the coastal nocturne into new, and more Gothic, territory, with its fearsome sea and bristling rocks. When Balke painted his most famous views of North Cape over the period 1840-59, most were nocturnes set in an eerie calm. Then around 1850, Balke turned his attention to some of the major Nordic cities, with this Moonlit View of Trondheim (c 1840-49), the gateway to the far north of Norway. 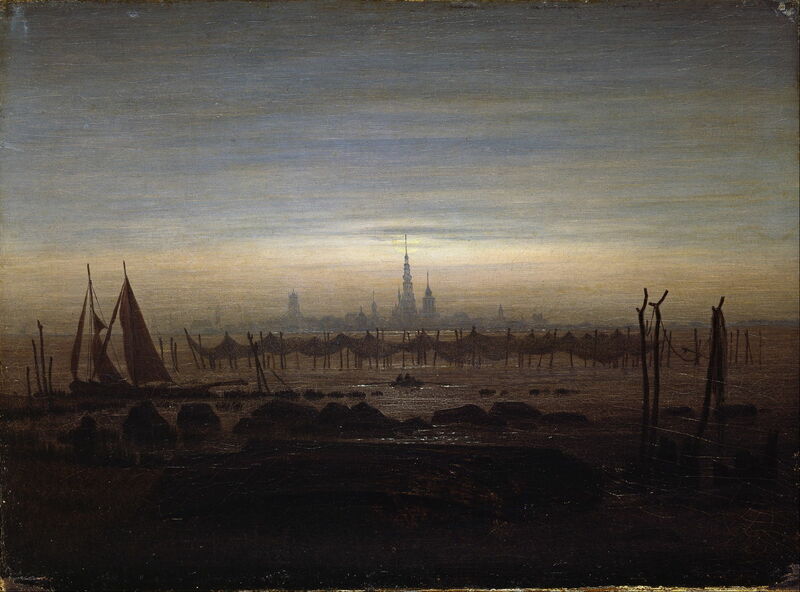 Balke’s superb Moonlit View of Stockholm (1851) is a matching coastal nocturne of the capital of Sweden. The next and concluding article looks at moonlit views of coasts painted during the latter half of the nineteenth century, and into the twentieth. Posted in General, Life, Painting and tagged Balke, coast, Dahl, Fearnley, Friedrich, landscape, nocturne, painting, Turner, van der Neer, Vernet. Bookmark the permalink.